Discussion in 'Political Debate & Discussion' started by Gold Dragon, Sep 8, 2018. The McCain eulogy was a light jab compared to this. I'm sure your news sources will not highlight the sections where he criticizes democrats and supports republicans since that doesn't fit the narratives they want to perpetuate. Here are some quotes that may interest folks here. I know it comes from a "classless jerk" as carpro likes to call him, but this jerk is a well versed student of the great American story. So neither party has had a monopoly on wisdom, neither party has been exclusively responsible for us going backwards instead of forwards. But I have to say this because sometimes we hear, oh, a plague on both your houses. Over the past few decades, it wasn't true when Jim Edgar was governor here in Illinois or Jim Thompson was governor. I've got a lot of good Republican friends here in Illinois. I'll be honest, sometimes I get into arguments with progressive friends about what the current political movement requires. There are well-meaning folks passionate about social justice, who think things have gotten so bad, the lines have been so starkly drawn, that we have to fight fire with fire, we have to do the same things to the Republicans that they do to us, adopt their tactics, say whatever works, make up stuff about the other side. I don't agree with that. It's not because I'm soft. It's not because I'm interested in promoting an empty bipartisanship. I don't agree with it because eroding our civic institutions and our civic trust and making people angrier and yelling at each other and making people cynical about government, that always works better for those who don't believe in the power of collective action. When I say bring people together, I mean all of our people. You know, this whole notion that has sprung up recently about Democrats need to choose between trying to appeal to the white working class voters, or voters of color, and women and LGBT Americans, that's nonsense. I don't buy that. And that common ground exists. Maybe it's not fashionable to say that right now. It's hard to see it with all the nonsense in Washington, it's hard to hear it with all the noise. But common ground exists. I have seen it.I have lived it. I know there are white people who care deeply about black people being treated unfairly. I have talked to them and loved them. And I know there are black people who care deeply about the struggles of white rural America. I'm one of them and I have a track record to prove it. The biggest threat to our democracy is indifference. The biggest threat to our democracy is cynicism – a cynicism that's led too many people to turn away from politics and stay home on Election Day. To all the young people who are here today, there are now more eligible voters in your generation than in any other, which means your generation now has more power than anybody to change things. If you want it, you can make sure America gets out of its current funk. If you actually care about it, you have the power to make sure we seize a brighter future. But to exercise that clout, to exercise that power, you have to show up. And that can be the legacy of your generation. You can be the generation that at a critical moment stood up and reminded us just how precious this experiment in democracy really is, just how powerful it can be when we fight for it, when we believe in it. I believe in you. I believe you will help lead us in the right direction. Obama was guilty of everything he accused Trump of. Only one man tried to make new laws all by himself and it wasn't Trump. Only one man actually used the IRS against his political opposition and it wasn't Trump. Only one man used the FISA court to spy against another American and it wasn't Trump. Only one man's AG was ever held in contempt of the Congress and it wasn't Trump's. Only one man stifled the free market system with regulation after regulation and it wasn't Trump. Only one man lied time and time again about his healthcare program and it wasn't Trump. Only one man agreed to the worst foreign policy deal with the Iranians and it wasn't Trump. And on and on it went with that complete failure of a President, one Barrack Huessein Obama - an empty suit if there ever was one. 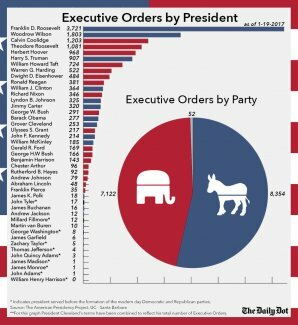 President Obama averaged 35 executive orders per year while president Trump is averaging 52. If you actually read them (and we know you don't) you will find that most of Trump's executive orders are calls for a study to be done on something and a report to be written about the study, whereas Obama's EO's actually made policy. Legislation via his pen. The big difference would be that trumps are legal and good for America! Why are Trump's legal and Obama's were not? Here are Trump's (and the other President's) executive orders. Read them yourself. obama did many that were not constitutional, as when it took it upon himself to mandate thngs in regards to immogration, which is Congress to do, and to keep amending Obamacare, again only Congres can do that! The question is not can a Presudent do executive orders, but if they are lawful and good! I read most of them about a year ago. Have you read them? A lot of Trump's orders were undoing Obama's. Obama bragged that he had a pen and a phone so he drew attention to himself. Some of Obama's orders were overturned by the courts, if my memory serves me right. Obama said that he was going to follow the modern tradition and allow his successor to proceed without his criticism, but he has been a shadow president, following Trump around the world and trying to stay in the limelight. However, he is poison on the campaign trail and many Democrats are telling Obama that they do not want him to campaign for them. Obama did so little for blacks that now they approve of Trump by 36%. Nancy Pelosi is so hysterical over this development that she has actually called some black Republicans such as Will Johnson by the name of white racists as Antifa did to Candace Owens outside a Philadelphia coffee shop about a month ago--that was very funny because the cops were all black or Hispanic and Antifa were all white rich kids calling black working people white racists. Obama sometimes wears a tan suit. Obama is the deep state. He ordered all of the FBI tricks against Trump and ignored all of the criminal acts of Hillary Clinton. Hillary belongs in federal prison and Obama should be investigated by the US Marshals Office or someone, but Trump and the GOP don't want to bother. Hillary Clinton wants to run again in 2020 just to make sure that her first loss was real. Not necessarily ridiculous as it also depends on the nature, scope and restriction of the executive orders (of which much documentation has been supplied). Obama's were apparently stifling to capitalistic endeavors. The best thing that could happen is for mR Obama to lash out and talk wild, as that will solify and ralley the reublicans to make sure crazy dems kept out of office! Incredible given the mandates Trump has put out on immigration! Glanced at the titles and read a few. i see nothing indicating that Obama's were illegal as has been asserted here while Trump's were not. Moving the goal posts again, I see. Let's review. Do keep up. Your point was that Trump had issued more executive orders than Obama. I said most of Trump's EO's were inconsequential studies whereas Obama's had the force of law. My point being that it's not the quantity, it's what comprises them. You counter by saying Obama's weren't illegal. The Supreme Court has approved his, but did not Obamas on it! Another section that should appeal across party lines but may not in these tribal "truth is not truth" times. Oh, I am here to tell you that even if you don't agree with me or Democrats on policy, even if you believe in more Libertarian economic theories, even if you are an evangelical and our position on certain social issues is a bridge too far, even if you think my assessment of immigration is mistaken and that Democrats aren't serious enough about immigration enforcement, I'm here to tell you that you should still be concerned with our current course and should still want to see a restoration of honesty and decency and lawfulness in our government. The things President Trump has put out on immigration were well within his constitutional powers. Obama on the other hand, whose job was only to enforce laws passed by the Congress actually, tried to pass a new immigration law all by himself with his DACA executive order. He was caught on video time after time telling Hispanic audiences and others that there was nothing he could do for this group of people, and then suddenly he does it. That being said, please tell me where President Trump went beyond his constitutional powers?